Sanjay Dutt and Manyata celebrated two years of marital bliss on Thursday at their Mumbai home. The couple hosted a huge bash for their second wedding anniversary at their residence at Imperial Heights in Mumbai's suburban area of Bandra. 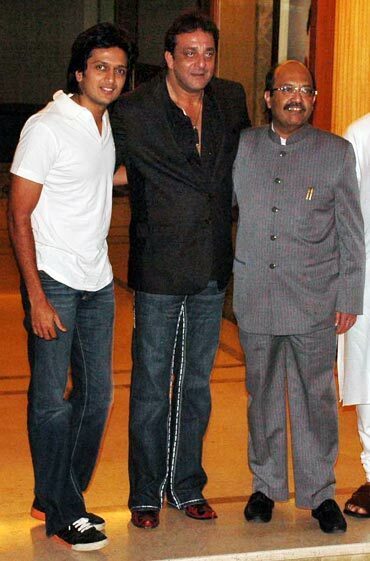 Sanjay Dutt's close friend, Amar Singh, was one of the guests at the party. The politician, who was recently expelled from the Samajwadi Party, mingled with Ritesh Deshmukh, the son of Congress member and former Maharashtra Chief Minister Vilasrao Deshmukh, at the bash. Among the invitees were Dutt's close friends like Ajay Devgn, Bipasha Basu, Suniel Shetty and wife Mana, Fardeen and Zayed Khan and Abhishek Bachchan. Also spotted were newlyweds Shilpa Shetty and Raj Kundra. Siblings Amisha and Ashmit have obviously patched up, and seem happy in each other's company. Kangna Ranaut ditched her off-shoulder dresses for this demure traditional outfit. After sporting backless cholis, Sanjay Dutt's co-star in Lage Raho Munna Bhai, Vidya Balan decided to go with this churidar ensemble. Dutt's Plan co-star Dino Morea also made it to the bash. 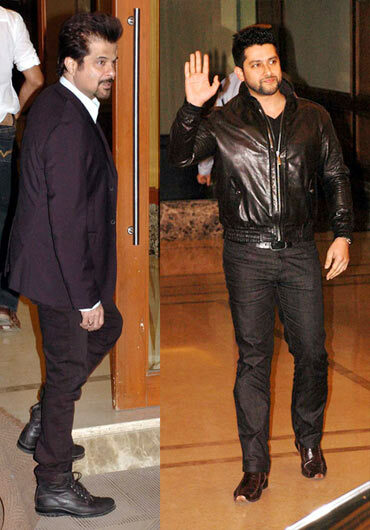 Men in black Anil Kapoor and Aftab Shivdasani arrive at the venue. Anil Kapoor had starred with Dutt in Musafir, while Aftab had been a part of Dus Kahaniyaan, produced by Dutt's then production company, White Feather Films. Sanjay Dutt also invited all his director friends like David Dhawan (Chal Mere Bhai, Ek Aur Ek Gyarah, Haseena Maan Jayegi, Jodi No 1) and Rohit Shetty (All The Best). 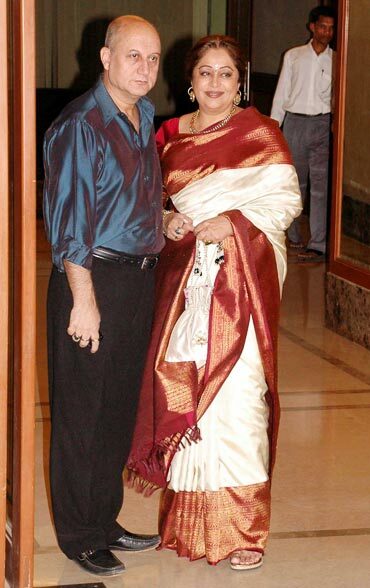 Seen here, are Anupam Kher and wife Kirron.